The first project meeting of the European side of the team has been held at UEA for the past two days. It has proved a fruitful and enjoyable meeting of minds (I hope I do not speak just for myself…!). We have talked a lot about scale: which scale is the most appropriate to reach a good understanding of the past of this part of West Africa. A 4x4m trench at a single site? A series of test pits at several sites? Survey over 20x20km? Enquiries in each household over 100km? Much depends of your disciplinary slant, too. However, in order to answer the questions that Crossroads was set up to explore – boundaries, technical know-how, the effect of political change – it seems imperative we operate both on a very fine-grained scale – getting a sense of how space was used within an individual settlement or even an individual structure – and the broad-scale – how, over a region (the entire valley, and its affluents), material culture changes. More to follow, after these first impressions hot off the press. The meeting now concludes with a talk at the Centre for African Art and Archaeology and a farewell dinner, till Benin. The Research Excellence Framework (REF) team today announces that following the consultation on draft panel criteria for the REF, the four UK funding bodies have taken an early decision on the arrangements for taking account of maternity leave in the REF. An overwhelming majority of respondents to the consultation supported the proposal that researchers may reduce the number of outputs in a submission by one, for each period of maternity leave taken during the REF period. In light of the response, the funding bodies have decided that this approach will be implemented across all panels. Here is today’s sherd of the day. It falls in the category ‘Incised’ and I’ve given it the catchy name ‘Sherd incised 21’. It’s a rim sherd, broken at the lip, and it’s about 5 mm thick with a gritty orange fabric. In terms of decoration, there are at least six separate processes going on here. First off, the potter had a blank surface. He or she burnished part of it – made it shiny by polishing it with a smooth tool like a stone or a string of baobab seeds. That’s what is at the bottom of the picture here – you can’t see it because my scanner couldn’t capture it. Then the potter took a comb – maybe a series of acacia thorns stuck in a piece of clay, maybe a metal comb or one cut out of a piece of calabash – and made seven diagonal parallel lines and then, across them, a series of seven or eight parallel lines. Then a row of small triangular incisions with something which must have looked a bit like a stylus. 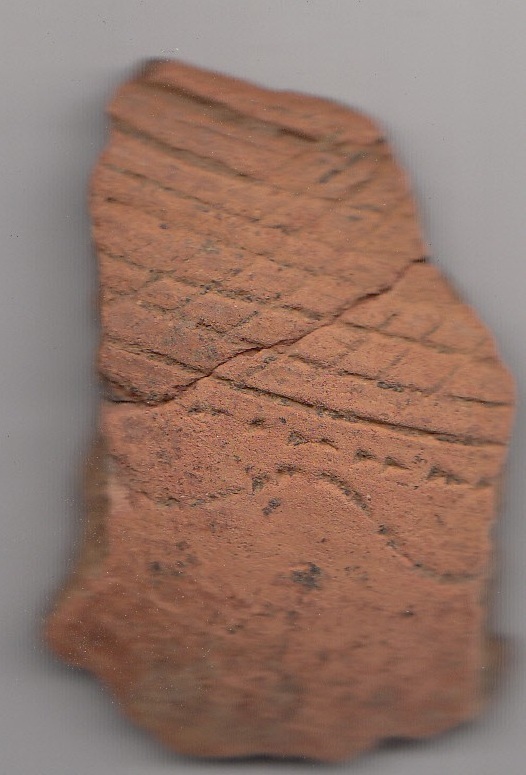 Finally, a wavy line was drawn onto the sherd, possibly (you can’t really tell – it’s quite eroded) by imprinting a piece of string. This sherd was recovered in a layer 25-50 cm deep at BLAF. A sample of charcoal recovered at 47 cm in association with some bone yielded a date of between AD 660 and 770 calibrated at two sigma. The inference is that this sherd is of a similar age, although that’s actually older than we expected the site to be. We welcome another new contributor, Dr Sam Nixon! Sam has just been appointed as a Postdoctoral Researcher in African Archaeology at the Sainsbury Research Unit (UEA) and will be joining the Crossroads project from January 2012. Sam completed his PhD at UCL Institute of Archaeology (London), researching the early Islamic trading towns that developed in the West African Sahel as the main exchange points for the growing trans-Saharan trade. The research was focused around fieldwork at the site of Tadmekka in northern Mali, this site having been identified as an ideal new testing ground for investigating the development of West African trans-Saharan trading communities and their consumption practices. Since completing his PhD Sam has been an Honorary Research Associate at UCL, writing a monograph on the Tadmekka research (to be published next year in the Journal of African Archaeology Monograph Series) and a number of other specialist publications. He has also been assisting with the British Museum exhibition Hajj: journey to the heart of Islam (commencing January 2012). His current developing research is looking at the growth of Islamic trading communities in the savannah and forest zones of West Africa. Sam’s research into trading communities and the material culture remains of trade will provide a useful complement to the existing research skills of the Crossroads project team. He also brings a wide range of archaeological skills to the project, including experience coordinating specialist studies of ceramics, archaeometallurgy, and archaeobotany. Sam will be a central member of the team for exploring the project literature and helping coordinate analysis of material, and will provide regular updates on these aspects of the project. Things have been progressing well with the desk-based and management aspects of the project. We have now hired a new postdoctoral researcher and are in the process of purchasing a car for the project. We are gearing up for our first steering meeting for European team members, here at UEA in two weeks’ time. Ali has been preparing maps of the survey sites sampled in our last field season, Carlos is setting his mind to the geophysical analysis of potsherd pavements, Veerle and Paul are turning their minds to the faunal and soils analysis of the Niger Valley sites, Didier is writing about the previous archaeological knowledge of the region, and Olivier has been pondering Sorko fishermen. The pottery analysis is going well – thank you for the compliments I have received on ‘Sherd of the day’. The simple reason I have not been able to keep up with this lately is that I have been working on the plain sherds, which, all apologies to them, are rather boring. You can look forward to more exciting sherds in the coming weeks when I begin the analysis of the folded strip, twisted cord, incised, appliqué and (always with a frisson of excitement) ‘Other’ categories.